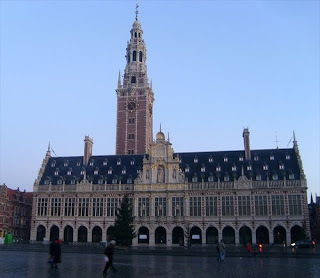 Leuven is only an hour from Namur but it is nonetheless a perfect place for an Erasmus stay. Studying in Leuven is indeed a good opportunity to learn to know a Belgian city very well and, of course, to speak Dutch. The people responsible for the exchange students (such as Mrs Kerstens) made my arrival in the city very easy. Their office is open every morning from Monday to Thursday, so I never struggled long with a problem. For example, I found a student room very easily. I was allowed to choose nearly any courses I wanted. Here were my 5 courses (10 hours a week): English Literature from 1800 to the present (BA 2), History of the Low Countries at the Crossroads of European History (with foreign students), sociolinguistiek (BA 3), mediasociologie (BA 2) and Italiaanse cultuur (BA 1). I would recommend you all 5 courses. 10 hours a week, this is not much. However, I had a lot to do by myself (papers to write, books to read, and so on) but I wasn’t up to my eyeballs either. 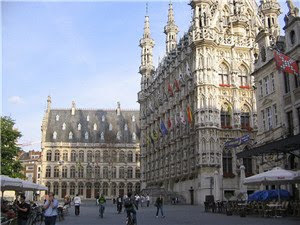 Thanks to this, I had time to discover the city and enjoy my stay in Leuven not only as a student but also as a tourist. In September, short before the start of the classes, the university organizes several city trips for exchange students (for example, we visited the European Parliament in Brussels and the American cemetery of Henri Chapelle).The KUL (Katholieke Universiteit Leuven) offers students many facilities such as a free sports card and a free bus subscription. Although I didn’t use my sports card a lot, I can tell you the sports centre offers a large amount of facilities (a swimming-pool, tennis courts, a lane, and so on). I often went jogging on the outskirts of Leuven, which was very pleasant. I also worked in a café in the centre of Leuven: I met many Dutch people there and I improved my knowledge of the Flemish language. In the evening, I often let my hair down with friends in the trendy bars and cafés of Leuven (on the Oude Markt, especially). I am very happy with the student flat I lived in. I got on really well with all my flatmates. They were all Flemish students (9 in total). We usually met at supper-time in the kitchen, where we talked a lot and watched our favourite Flemish series “David”. We often organized parties and they sometimes gave me a hand if I had a problem with my bike (they are real experts in the subject!) or with the papers I had to write in Dutch. The exam period was (too) long and thus very exhausting. I had nearly a whole month to study before the exam session; the latter lasted for two weeks. As the exam period lasted until the end of January, I haven’t attended the first week of the classes here in Namur. Also, I didn’t have any holiday. However, the exam results are already coming out by the end of this week, which is very quick because it is only a week after the end of the exam period. In the beginning, my Erasmus was a leap in the dark but as I visited the city, I got to know it and its inhabitants better. Now I can say that I completely fell in love with Leuven. The historical buildings are spread all over the city (among them, I can list the City Hall, Saint Michael Church, the beguine convent and the Central Library). Leuven is not a big city but there are as many students as bikes, which is a lot…! The Flemish people are very friendly and many exchange students have chosen to come and study in Leuven, so it is very easy to make friends. According to me, the inhabitants of Leuven are very proud of their city and the city is therefore very clean. It is very hard to get bored in Leuven: there are numerous cafés and clubs (for whatever appeals to you), several cinemas, museums (e.g. Museum M), many concerts and many shops (e.g. in the Bondgenotenlaan, the street facing the station). Three tips: 1) don’t go to Leuven without bringing your bike along (and a good padlock)! ; 2) I would recommend you the pastries of the Vangrootloon bakery (yum! ), the “Alma”, the cheap student restaurant, and, more generally, the many restaurants of Leuven (Italian, Indian, Chinese, Japanese, Mexican or, last but not least, typical Belgian restaurants); 3) you should pay a visit to the magnificent Central Library! All these things make Leuven a very nice city to live in and a perfect place for an Erasmus stay.